Research: Who made the spaceman carving and when? The photographs and text have been circulating via email for years now, in the form of an attached PowerPoint slide show. The photographs show a carving of an astronaut on the facade of a cathedral in Salamanca, Spain. The same photographs have also been posted to a number of online forums and blogs on which they have generated a considerable amount of debate. While some commentators have suggested that the astronaut has been added using image manipulation software, other observers have come up with more outlandish explanations, including time travel, alien visitations in ancient times and amazingly precise predictions of the future by the artists who decorated the original buildings. More down-to-earth observers have drawn the most obvious conclusion, which is that the astronaut carving was added to the building in much more recent times. And, in fact, this more sensible explanation for the "mystery" is entirely correct. The astronaut, along with other contemporary symbols was added in 1992 during restoration work on the "new" cathedral. The person responsible for the restoration, Jeronimo Garcia, reportedly chose an astronaut as a fitting symbol of the twentieth century. According to an article about the restoration (in Portuguese - Click here for Google translation to English), it is a tradition of cathedral builders and restorers to include a contemporary symbol on the building as a means of "signing" their work. So according to the article there is actually no mystery about the Cathedral "spaceman". The message has some other inaccurate details. It claims that the astronaut carving is on a cathedral that was built in the year 1102. However, the carving actually graces the wall of the "new" cathedral. Construction of the New Cathedral of Salamanca began in 1513. The Old Cathedral, located nearby, is the building that dates back to about 1100 AD. Research - Who made the spaceman carving and when? 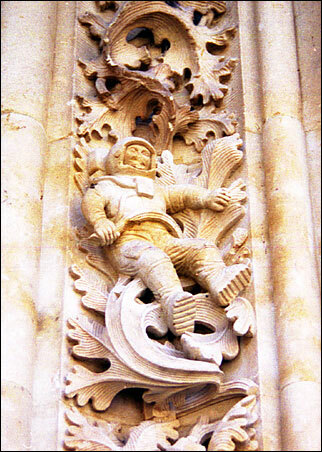 An astronaut, a decorative element of the Puerta de Ramos in the New Cathedral of Salamanca, Spain. Cathedral in Salamanca Spain, Catedral Vieja and Catedral Nueva - City Guide for Salamanca , a historic city of Spain and a world Heritage Site. Note: Personally i think the carving is indeed from modern times but i havent figured out yet when and by whom. I find myself on the planet Hatzes, it is a small planet with two oceans, one blue and one green, which orbits at about 0.5 AU from the star Epsilon Eridanus. The civilization that found here associates a radical form the very old with the latest technology. The latest inventions of Hatzianos are thoroughly integrated into the landscape of their historical and artistic metropolises in a discreet manner, without spoiling. Their cities are both secular and technological. The example land that comes to mind is the astronaut cathedral of Salamanca. During the restoration of Port Ramos of the New Cathedral of Salamanca in 1992, have been integrated into contemporary and modern motifs, including a carved figure of an astronaut. The insertion of this motif is due to the tradition of the old cathedral builders and restorers that reason was to use a contemporary, hidden among the oldest motifs in order to sign their works. The person responsible for the restoration, Jeronimo Garcia, chose an astronaut as a symbol of the twentieth century. The very silhouette of the city of Salamanca has been completely restored a few years later, in 2002, it was European Capital of Culture. The modern buildings built located in the city center were all covered with thin slabs whose color is similar to the original stone used in construction of the Cathedral and other historic buildings. Salamanca has returned to the Golden City - Salamanca qualifier secular long-lost, which was due to the golden city when it acquired the stones of its buildings were bathed in sunlight. Unfortunately, Portugal still spoil much of what is old, what is heritage, and simultaneously despise the modern. It would be unthinkable for the vast majority of our assets include elements responsible for the modern when rebuilding or restoring the many dilapidated buildings of our country. There is a general alienation of science, technology and great difficulty in dealing with subjects such as mathematics, chemistry or physics. We venture to leave a cultural legacy ephemeral and unattractive for future generations and for those who visit us, otherwise this Hatzes contemplating. The article says; " The person responsible for the restoration, Jeronimo Garcia, chose an astronaut as a symbol of the twentieth century". The info below that i found on Jeronimo Garcia says he was famous by 1600, while the spaceman carving was added by Jeronimo Garcia in 1992 according the article and the Wikipedia article about the cathedral ??? The information references dont seem to be correct. Napoleón invaded Spain. During the French invasion churches were destroyed and part of its silver treasures were stolen. Chapel of the President. Named for being founded in 1577 by Francisco Fernandez de Liebana, president of the Royal Chancery of Valladolid. The altar has an altarpiece divided into two bodies. The superior embodies the Apparition of the Risen Christ to the Virgin and the lower the Burial of Christ, according to some authors may be attributable to Navarrete "The Mute". Opposite is the small and fine sculpture of the Virgin of Bethlehem could be the work of Luisa "The Pulley". Next, on a pedestal, the pathetic Ecce Homo, School of Mena. In the center an impressive chapel crowns the lamp possibly Ippolito School, and nestled in the twentieth century. Gothic style cathedral with a basilical floor design crowned and with an ambulatory. It is the next to the last Gothic cathedral of Spain. Its construction began in 1513 and did not conclude until 1733. Although its style is essentially Gothic, Baroque, Plateresque and Neoclassical elements can be found . In this sense, the Baroque tower stands out. Throughout the 15th century the city of Salamanca experienced significant demographic growth that, among other things, made the Romanesque cathedral unable to hold such a large population. In 1491 the town council took into consideration the idea of constructing a new temple, that would be beautiful and spacious, and harmonise with the stateliness and importance that Salamanca had acquired throughout the century. But it was not until 1510 when steps began to be taken for the construction of the new temple. With this in mind, a meeting of experts was called to examine the proposals of different architects. In 1512 this meeting decided to maintain the old Romanesque cathedral in order not to interrupt religious ceremonies and the project was given to Juan Gil de Hontañón. Juan Gil was one of the most outstanding architects in Isabelian Gothic art. Construction on the cathedral began May 12, 1513 and from the first moment was marked by continuous critisims and litigation that different architects brought against the project of Gil de Hontañón. These disputes not only slowed down the construction process, but also led to numerous revisions of the initial project. It was not until 1733 that the cathedral was finished. It is necessary to make a special reference to the Bell Tower of the Cathedral of Salamanca. The Old Cathedral of Salamanca originally had two towers: the "Mocha" (or "Blunt") tower that is still conserved, and the tower of the "Bells". The town council decided to maintain this tower and, after elevating its height, have it serve as a steeple for both cathedrals. The history of this tower is marked by continuous misfortunes. In 1705 a lightning bolt struck the tower and caused a fire that damaged it severely; the main bell fell to the street; and one of the small ones melted due to the heat. The tower had to be rebuilt under the direction of Pantaleón Pontón, who gave it the appearance that it has today. In 1755, the serious damage caused by the earthquake of Lisbon to the cathedral made some experts consider demolishing it. Finally the problem was solved by placing metal reinforcements in its structure. In 1940 the damages caused by the Spanish Civil War. The last stage of the Middle Ages was characterized by a social, cultural and economic revolution. Little by little the bases were being set for what was going to be the Renaissance: the figure of man began to becom important once again. Urban life flourished again, and the medieval class system became more heterogeneous with the consolidation of the bourgeois. These changes were reflected in the art of the moment: Gothic. Gothic architecture is colour, light and elevation toward God. Cathedrals became its maximum exponent. The cathedral of Salamanca is one of the last works of the Spanish Gothic period. Its floor design is rectangular and basilical with three naves and side chapels located next to the buttresses. The exterior is structured according to the medieval ad triangulum outline, characterized by a progressive development of the naves. On the walls a rhythmic movement takes place between the windows and the buttresses, which are projected upwards by flying buttresses and pinnacles. The top is crowned with a beautiful display of balustrades and crest plates. The main facade was originally decorated with five arches, but the one corresponding to the chapel on the right disappeared in the 18th century when the base of the tower was widened to avoid its collapse. Among them the central one, also known as the Facade of the Nativity, stands out. In the lower part we find a door with a mullion, and the image of the Immaculate Virgin. The arches are flattened, which is characteristic of the Plateresque. In the middle section the Nativity and the Epiphany of the Lord are depicted above a tri-lobulated arch crowned by a large keel arch. In the upper part of the facade the Calvary of the Lord is represented with the figures of Saint Peter and Saint Paul. Symbolically, it is the eternal message of the beginning (the Nativity) and end (the Calvary). The façade of Palms, on the northern wall, represents Jesus' entrance into Jerusalem and it follows the same structural outline as the façade of the Nativity. The bell tower and the dome are Baroque. The interior of the cathedral stands out due to its width and the great magnitude of its heights. The visitor feels he is in a forest in which the top of the trees rise toward God. The dome stands out under the cross vault. Its drum is decorated with panels that represent scenes of Mary. The dome is neoclassic and is articulated by means of Corinthian columns. The chapels are located along the side naves. There are two which stand out: the Golden Chapel (or "all saints chapel") and the Chapel of the Sacred Christ of Battles. The Golden Chapel is in fact a small church inside the cathedral. It has choir and its own sacristy and it is thought that in its day it even had a small organ. In it all the saints from the beginning of time to the 16th century are represented. The chapel was founded by archdeacon Francisco Sánchez de Palenzuela; he is represented lying below an arch. At his sides are the figures of his parents and nephew who are praying. Above them in a niche is the figure death. In the chapel of the Sacred Christ of Battles, the Christ that is worshipped is the one that Bishop Jeronimo Visque took into battle. According to the tradition, Christ accompanied the Cid in his battles. The seats of the choir are one of the best examples of Baroque carving. It was designed by Alberto de Churriguera. Carved in walnut wood, the choir is organized into two floors with a total of 104 seats. On the lower floor there are medallions and reliefs of saints and martyrs. On the upper floor bishops and prophets has represented. The collection is crowned by a crest plate formed by little angels playing musical instruments. In the centre of the choir there is a lectern with the effigies of the prophets. In the mullion of the main façade there is a figure of the Immaculate Ascension with angels on either side. The one on her right is carrying a kind of poster which has a phrase in Latin referring to the Assumption of the Virgin: "Assumpta est María in coelum"; The one on the left is missing an arm. Originally it too was carrying a poster which made reference to the Virgin's immaculate conception. But the poster was sawed off in the 17th century by a religious current that rejected that idea. En 1755 the earthquake of Lisbon damaged the bell tower. The bell system was so damaged that a bellringer had to climb up to the bells to make them ring. Today that event is immortalised in a tradition that continues, and on October 31 a person dressed in a typical Salamanca suit, climbs to the top of the tower and plays a traditional song. Every day from 10:00 am to 1:00 pm and from 4:00 pm to 6:00 pm. Salamanca has two cathedrals, the Old Cathedral , of the 12th century and of Romanesque style, and the New Cathedral , much larger, built in 16th century of Gothic style and completed in 18th century. The place where it join both is known as Patio Chico and is one of the most charming corners of the city. Salamanca has two cathedrals, the New Cathedral and the Old Cathedral , and these are located side by side and connected. The New Cathedral was started in 1513 and finished in 1733. The style is a mixture of Late Gothic, Renaissance, and Baroque. The tower was started in 1705 and later the Churriguera brothers built the dome. The dome had to be reinforced in 1763 because of the Lisbon earthquake of 1755. The interior has 3 naves with wide pillars and side altars, and the dimensions are 105m x 50m. The dome starts 80m over the floor. The Catedral Nueva (New Cathedral) was originally proposed in the 15th century as a replacement for the Old Cathedral, given the swelling population of Salamanca in that period due to the intense influx of students from around the world looking to study at the renowned University of Salamanca. Its construction was finally ordered in 1509 by King Ferdinand and went on throughout the Spanish Golden Age. The New Cathedral was constructed right next to the old one. The old cathedral was due to be demolished to make way for the new cathedral, but because one of the walls of the new cathedral was structurally dependent on the old one it was ultimately kept, allowing for religious services to continue there for the duration of construction. Work on the cathedral stopped throughout the 17th century, which saw the decline and fall of the Spanish Empire, as it had become too expensive to maintain. It was not restarted until the 18th century, finally concluding and consecrated for its religious duties in 1733. On November 1st, 1755, the Great Lisbon Earthquake severely weakened the cathedral's structure and it had to be reinforced. The belltower was particularly damaged and was left tilting to one side, precariously close to collapse. Many architects recommended its demolition. Eventually it was reinforced with 8 tensed chains and encased in stone adapted to the tilt. So it remains to this day. Some of the cracks in the cathedral's foundation and stain glass windows have also survived the passage of time though constant restoration is needed in order to maintain this memorable building in the modern day. The New Cathedral is late-Gothic in style and is one of the last two Gothic cathedrals built in Spain (the other being that of Segovia), though many Barroque features were later added. Catedral Nueva also has some tricks up its sleeve that will challenge your perception of a cathedral, for example the carving of an astronaut on the façade, which can be seen oddly placed in a mixture of more familiar carvings for a cathedral. The carving might have people believe the designers really meant it when saying it would be the new cathedral. The bubble is burst on interpretations of time-travel or alien intervention, as the astronaut was fruit of contemporary restoration work on the Puerta de Ramos in 1992 and meant to symbolise the beginning of the impending new millenium. The organ of the cathedral has proved its longevity and that of the cathedral itself, having remained in perfect tune for a century! Many buildings of historical importance in Salamanca are of sandstone. Over time, this sandstone becomes covered with a coat of natural patina which makes the whole building appear golden in colour. Apart from this patina, another artificial reddish patina or paint can be observed on some of the buildings, mainly on the ornamentation of portals in the flamboyant Gothic and Plateresque styles. The samples in this study come from the Ramos Gate of the Catedral Nueva in Salamanca, Spain. The inorganic and organic compounds were analyzed using the following techniques: scanning electron microscopy (SEM), energy-dispersive X-ray analysis (EDAX), Fourier transform infrared spectroscopy (FTIR) and gas chromatography/mass spectrometry (GC/MS). The results showed that the inorganic compounds are clays and iron oxides, while the organic materials are albumin, traces of collagen (serving as binding material) and small amounts of fat. For the sandstone, this coating proved to be an excellent protection against external weathering agents. City Guide for Salamanca , a historic city of Spain and a world Heritage Site.